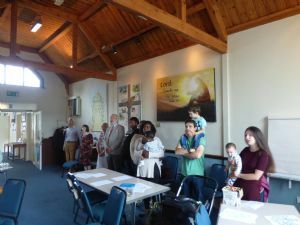 About 60 people of all ages meet in our buildings on Burford Street every Sunday morning at 10.00 am for a service lasting about 90 minutes. 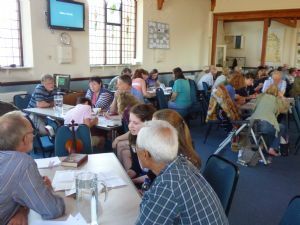 During the service, there will be songs and hymns sometimes with the accompaniment of the band, prayers, Bible readings and a talk of approximately 20 minutes. We also have a crèche for the under 3s and groups for children and young people, who all join us for the last part of the service. We have communion on the 4th Sunday of every month. Communion (or the Lord's Supper or Eucharist), is the name given to the sharing of bread and wine together. All those who love the Lord Jesus and are seeking to follow Him are invited to join with us in this part of the service. Private prayer with or without a member of the prayer team is available after every service. As part of our worship an offering of money is collected in our Sunday morning meeting. The money is used to support our ministry locally and mission overseas. Please do not be embarrassed to simply pass the bag on to the next person. After the service coffee and biscuits are available for everyone with time to meet people and chat. On the 1st Sunday of the month, the morning service is followed by lunch, to which everyone is welcome to stay. No evening meeting, as we are still recovering from our lunch together! Communion in a quiet and reflective style. other speakers and opportunities for prayer. An opportunity to pray together. Our services are open to all and you can come just as you are. There are no complicated books to follow and you will not have to take part in anything you are uncomfortable with. We understand that some people just want to slip in and out unnoticed, while others may like to stay for coffee afterwards.